In 1897 England, sixteen-year-old Finley Jayne has no one except the "thing" inside her. When a young lord tries to take advantage of Finley, she fights back. And wins. But no normal Victorian girl has a darker side that makes her capable of knocking out a full-grown man with one punch...Only Griffin King sees the magical darkness inside her that says she's special, says she's one of them. The orphaned duke takes her in from the gaslit streets against the wishes of his band of misfits. Emily, who has her own special abilities and an unrequited love for Sam, who is part robot; and Jasper, an American cowboy with a shadowy secret. Griffin's investigating a criminal called The Machinist, the mastermind behind several recent crimes by automatons. Finley thinks she can help-and finally be a part of something, finally fit in. But The Machinist wants to tear Griff's little company of strays apart, and it isn't long before trust is tested on all sides. At least Finley knows whose side she's on, even if it seems no one believes her. If the city of London was a body, Whitechapel would be the groin; a great unwashed area that only showed itself under the cover of darkness, and only for the most salacious of entertainments. No one of “proper” birth ever admitted to going there, but they all did at one time or another—or at least they wanted to. Slumming was very popular these days. 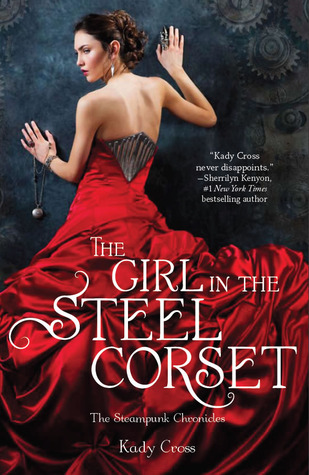 Girl in the Steel Corset is set in Victorian England and is a really great example of the alternate history that Steampunk writers like to create. The world building was great and the way that Kady Cross talks about all the gadgetry and inventions really works. 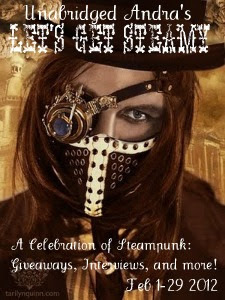 Though there is the assumption that the reader knows basic Steampunk terminology, most of the words are general knowledge or easily picked up as the story progresses. What set this book apart was the tendrils of other stories that were woven into it. For example, Finley's father was apparently the basis for the Dr. Jekyll and Mr. Hyde story. And Griffin's parents inspired the Journey to the Center of the Earth books. The plot was very well written and massively creative. Kady somehow manages to include those threads of other books without damaging her own integrity and creativity. She takes these classics and entwines bits and pieces of them into her story so those readers that have also read the classics get a real kick out of finding the threads in Girl in the Steel Corset. I really enjoyed the book, yet at the same time, some things just didn't sit right with me. It is very hard to describe my feelings for it because they are kind of abstract. It was like the book was a sort of a sketch...no, more of a watercolor of a really great painting...but it wasn't quite the finished product yet. There were things I could have used more information about, like Finley's dad's illness/madness, and Griffin's parent's travels to the center of the earth. The dialogue was also something that bothered me because it felt a tad forced. The characters were kind of like a group of people pretending to be best friends instead of actually being best friends and it really shone in how they spoke to each other. The weird disconnect between the friends kept me from fully connecting to them as well so I couldn't say that I was in love with any of them by the end. Don't get me wrong, I really liked some of them and I was on the edge of my seat a few times when it looked like one of them wouldn't make it, but I just didn't bond with them as much as I would have liked to. *sigh* I so totally love it when the love interests come up with nicknames for main characters...something about them (especially original or super cute ones) just makes me melt. I adore that Jack calls Finley "Treasure" and really plays around with her in a super cute and fun way...I was really hoping that Jack would have more screen-time in this book. I can only hope that he will be back in the next. One thing I think is incredibly cool, is that I believe we are going to get the best of both "time periods" that are popular in the steampunk genre in this series. Jasper is an American cowboy...he ran to England to escape troubles with the American law and the end of this book hints that the future of the series lies with Jasper and his problems. I have never read a series that tries to explore both the cool and snobby Victorians as well as the firey and gritty Americans in the same go. I can't wait to see what Cross comes up with because she did so well creating a mixture of time and place in this book. I can only hope that by spending more time with the characters I will come to love them a little more. I give the Girl in the Steel Corset 3.5 out of 5 Keys. The plot was super cool, original, and enjoyable, if a little bit expected. I found myself guessing all the major plot points well in advance so a lot of the mystery was lost on me. I enjoyed reading it, but didn't get emotionally connected to the characters whatsoever. Even the love interests left me feeling disconnected and vaguely indifferent, which almost never happens for me. Sometimes it takes a while for me to warm up to certain people in real life, and the same can be said of characters in novels. I'm hoping Finley, Griffin, Jack, Emily, Sam and Jasper continue to grow on me as their adventures continue. . Commenting on this review qualifies for an entry into the Grand Prize Giveaway of Let's Get Steamy! I have to admit, I gave this one a five star. I absolutely loved it and the characters were great. I do understand the bit about them pretending to be friends instead of just being friends, but I think that was more on Finley than anyone. And it made sense in the context I think since she has a hard time trusting people. Hopefully all of that will be fixed in the second book. And yes! I love Dandy. :) When he calls her Treasure, that just makes me so happy. I admit I first wanted to read this because of that red dress but steampunk...hey sounds good. I still would like to give it a whirl even though you found some flaws. I think I rated this book higher on Goodreads...I don't really remember it though...I remember really liking the plot and Finley...not much else though! Maybe it's time for a re-read! The Strange Case of Finley Jayne caught my interest and made me want to read more about this character. This book did not disappoint and only intrigued me more. Each person evolves throughout the whole book. And then makes you want dive right into the 3rd book... Truly well written and interesting, even for a picky reader like myself.